Users have been so complimentary about 'Contact Lenses Express' website. Some of the more wonderful comments, just so we would say a big public 'thank you' to everyone who's sent testimonials about this site. We really appreciate your kind words. Really happy with this service. Have used it for a few years now and never felt the need to search elsewhere. Always so convenient to order and quick to deliver, with that little extra from the offers making it even better. Thank you! Very satisfied. So much so, that I don't look elsewhere. Thanks. I have used contactlens express for a number of years & due to their commitment to customer satisfaction I will continue to use them in the future. Cheers !!! My order took longer than usual,you're normally super speedy, and it would have been nice to get an email explaining my lenses were temporarily out of stock and there would be a delay,rather than me having to chase it up myself. But that's just a very minor point,as I'm always happy with your service! 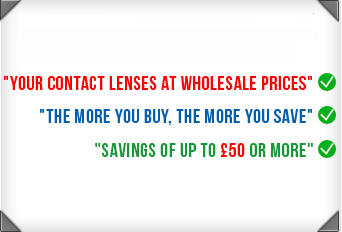 The easiest and cheapest way to order my lenses and solutions. I will definitely continue to order from you instead of my expensive optician. Thanks. Brilliant to be able to reorder at one click of the mouse - don't know hope we coped before you came along! Superb service on previous order when I had made an error on the lense specification. The team contacted me by phone to make sure my I was supplied with my correct fitting. Amazing fast service and incredible customer services. Congratulations. Very satisfied hence repeat orders, reminder service is helpful, on the one occasion I had a problem it was resolved within 24hours so keep up excellent service & I'll stay a loyal customer. I had bought some lenses and one was ripped when I opened it. I emailed the support team and had a replacement lens the next day. Excellent service.